Croft Structural Engineers has followed the recycling mantra for many years. Reduce: Our daily design work is to try an minimise the materials used: Lighter Steel, more slender columns, shallower footings. Reuse: Renovation and conversion work significantly reduces the amount of C02. Why knock a building down if it can be reused. Recycle: Many materials are recycled in the industry. Croft commonly specifies left over power station ash in concrete to replace cement. 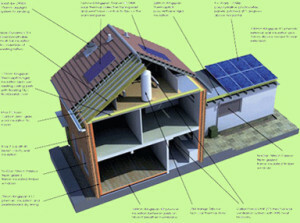 The practice has been involved in several Passivhaus projects. The aim of these projects is to minimise the CO2 use of the building to zero. With high levels of insulation this is possible. When insulation reaches very low levels of heat loss every area must be inspected. This is where we find as structural engineers our typical construction technics are scrutinized; no heat loss is allowed through cold bridging. We must try and wrap the entire building in insulation and isolate it from the ground. This sounds simple until one considers a steel or concrete column sitting on a concrete footing needs to be isolated from the ground. Insulation is typically soft and airy and far from useful under a foundation. This is where the devil is in the detail and structural engineering becomes “fun” are we have to come up with new solutions for old problems. New build detached house and stables. Design incorporates many new sustainable design ideas. The timber frame is designed with increased thickness to accommodate high levels of insulation dramatically reducing the heat loss from the building. A green grass roof is included over sections of the stables and house to help the design blend into the environment. Sustainable services design provided by Building Design Partnership. Currently around 70% of steelwork is recycled a fairly impressive record for any major industry. Blast Furnace slag is a by product of steel production. Through technological advances it is now possible to use this slag as a substitute for cement. To form steel it is heated to around 1200°C requiring furnaces producing high CO2 levels. When producing steelwork from ore the levels of energy required is even higher. The world market requires large plants located on a Global scale. It is therefore necessary to transport the steelwork considerable distances. The heat and transportation required results in high embodied CO2. Steel is a uniquely sustainable material because once it is made it can be used, as steel, for ever. Steel is infinitely recycled, so the investment in making steel is never wasted and can be capitalized on by future generations. Steel is a material that is used, not consumed. Steel can uniquely claim to be the only truly recyclable material because when steel is recycled, there is no down-grading. The steel recycling loop is a true closed loop. It is recycled and used again, without any loss of quality, time after time. The investment of resources in making steel is not wasted because steel is not consumed. Only truly recycled materials, which are never down-graded, but are used again and again with no loss of properties, can enable a sustainable future. The non-renewable resources used to make steel, like minerals and fossil fuels, are not wasted because the steel will be used forever. This is truly sustainable. Limestone is fired to 2400°C at which point a chemical reaction occurs and cement is formed. Sand, aggregate and water is then added to form concrete. There is various debate on the effect of large scale mining required to extract the base materials. Due to the low cost of concrete it is not financially viable to recycle concrete for reuse, but steps are being made to reuse it. Crushed concrete is often used under roads and foundations. At present winning favour in the industry for the most sustainable resource. During its growth timber absorbs CO2 effectively locking CO2 away within the structure. Softwood Timber in the global picture is a local resource reducing the transport. The jewel in the timber industry sustainable crown is FSC timber. Timber with this designation has been sourced from sustainable forests. As clients and builders are becoming aware of this it is being specified more readily. One concern is that FSC timber can only supply 10-20% of the total demand. If the demand outstrips supply the cost of FSC timber will become prohibitive. Once the building has reached the end of its design life the timber is not recycled. Burning or left to decay will release the CO2 initially locked into the timber. Timber decays and preservatives are required to prevent it. The type of preservative used and its manufacturer can cause a sustainability issue. However as concerns are being raised the timber industry is responding with better products. Croft Structural Engineers has vast experience working on timber builds and are advocates of its sustainable qualities. Take a look at our recent editorial on Timber Construction in Building Design & Construction Magazine. Read more . . .